Afrikan Beatz – Mbasso Ft Rodma Panina MP3 Download. Afrikan Beatz go for the broke with another banger titled “Mbasso”. On this one, they call on the feature of Rodma Panina on an effort plotted to cause a dent on the dance floors as well as create chaos and destruction even across social gigs. 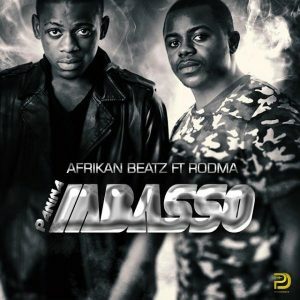 The Prolific Angolan duo, Afrikan Beatz, are well known for many Afro House sensations. Their hit song “I Like To Move It“ readily comes to mind. However, they are also noted for such smash efforts as “Before The Night Is Over“, “Kazukuta Groove”, “I Like This”, “Kiboba”, “Africa Dance”, just to name a few. However, on “Mbasso”, they team up with Rodma Panina, outside of their comfort zones for a fusion of Afro House as well as some Makossa/Soukous kind of vibe. This latest Afrikan Beatz creation is an absolute fire and fierce. Rain of banging, hard-hitting beats, energetic vocal deliveries, stunning instrumentals and an overall groove that will surely make you lose your manners. In fact, we are calculating the seconds to the weekend to get our crazy dance steps into disarray and without order. For full disclosure, “Mbasso” is highly addictive that stays on your mind and consciousness even after your replay button retires from too much grind and groove. Great news is that Afrikan Beatz have made this latest effort fly for free for the maximum enjoyment of their teeming fans all over Africa and beyond. All you’ve got to do is to join in that mood – simply stream, download and share your thoughts and opinion in the comments section below.